This product use WHO approved hi-tech formula, up-to-date producing technology, and it is a green and eco-friendly insecticide specially made for your beloved pets. Kill most of the parasite like fleas, acarids, ticks in your pets, and last for a long time, the pH is 5.0 - 7.0. the acute oral toxicity result is over LD50>5000mg/kg. Water based formula, have no irritation for both human and pets, no harms, no color-losing, no soiling, can increase the softness of your pets, after using, your pets would become refreshed, healthy, lively and even more lovely. 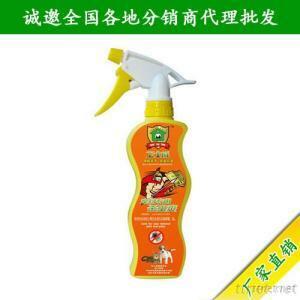 This product is praised as the pets’ “eudemon”. Block the eyes, mouth and noses of you pet with the hand, spray the product over the whole body of your pet, make it wet, the effectiveness would soon seep into the root of the fur, and you can massage the fur for a few minutes, then rinse thoroughly with water or shampoo, dry the pet with a towel. for the first period, use it once every 3 days, when the parasites are all gone, normally you can use it once or twice a week to maintain the effect and prevent the parasites cames again. This product is toxic to cold-blood animals, reptilia, fish, turtle. Store in spots that children would not touch easily, do not spray to foods, silkworm rooms, do not eat, after use, wash the skin and clothes by using soap, if unfortunately get toxic by it, please call 120 immediately, symptomatic treatment as pyrethroids intoxication.